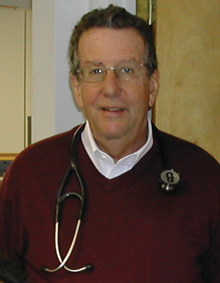 Dr. Robinson started the practice in 1981. He graduated the Medical College of Wisconsin and the Johns Hopkins Family Practice Residency Program in Baltimore, Maryland. He has been certified in both Family Medicine and Geriatrics. Over the years he has been a member of the Board of Trustees of the New Jersey Chapter of the American Academy of Family Medicine, and Past President of the New Jersey Medical Society Family Physician Section. Dr. Robinson has teaching appointments at Rutgers and Rowan Medical Schools. As well as a Safety Advisor for youth sports. Finally and most importantly a grandfather with two wonderful grandkids. Dr. Robinson is our champion of innovation, using the computer, Electronic Medical Records, and the internet to improve our patient access to their healthcare. As you are aware Dr. Robinson may or may not run on time. So, before you come to see him for your appointment today you can find out if he is on time or behind. Look in the upper right hand corner anytime to see how Dr. Robinson is running! Dr. Robinson works with Communicating Advantage on developing and maintaining his website. CLICK HERE to find out more information about the ‘Doctor on Time” feature.